F&I System, Auto dealer software, in the World! Dealer Management! This is not canned software, We customize it to your needs We install, modify and maintain the best selling auto dealer software. "We will make you want to kiss the screen"
We can program new forms via fax. (818)4885155 same day! 24/7 Telephone: 800 701-6686 Try it, call now! Made for Dealers (not for order takers) With Multiple Deal Desk! Auto Dealer Software DMS Print Forms Negotiate Sales & Lease. How Many Deals can your current DMS show at the same time? This is the Only Program out there for Dealers with Multiple Deal Desk Included! Multiple Deal Desk puts the Auto Dealer in control of the negotiation process, with a new Window for each plan you can offer, 4 Square your deals live with full control, Desk the work from all the closers on the same screen. A car Dealer's Dream come true, concentrate on highest bid, get back to being a Dealer! Best Auto Dealer Software. Dream come true. Now with Multiple Deal Desk Software for Dealers. We Do Auto Dealer BHPH and Lease Here Pay Here, Bookkeeping Soft. We Do Auto Dealer Fuel Expense Comparison FREE, Buyers Choice, . We Do Auto Dealer Credit card processing, Buyback, Promissory Note. Over 24 Years of testing and listening to you. Free Network support. We support 100% any and all printers, with perfect alignment. Canada, Mexico and the Caribbean Islands. If you think you are computer illiterate let us prove you wrong.. This is the easiest auto dealer software ever. Just point & click! We can help you with live support and remote control. This is the best Auto dealer software available. This program can be as simple or as fully featured as you want. We can install it for you and teach you how to use it right now Just call 800-701-6686, We do the rest. (at no extra charge) Best Selling auto dealer software! Ask about our new Rental Option. Ask about our Easy Terms. and get your documents signed on the screen. Click here for more info on the Master Pad. your company type or occupation. Auto Dealers Benefit when support is available 24/7 we understand your industry, Auto Dealers need to type cashable contracts, on the spot, and you need software that is simple to use, accurate and fast. We don't waste your time putting you on hold, you get the highest level support when you call. You don't have to dump your current DMS, you can also use us as a closing tool on the desk and in he box Just imagine! Closing Deals with real profits! "If you are not using Lease & Loan Master you are leaving Money on the table"
"A Dealer w/o Lease & Loan Master is like a Carpenter w/o a hammer." "W/o Lease & Loan Master a "Dealer" is just Ordertaking." How many Deals can your current DMS display at the same time? having to save any. You can make the screen you are working on any size, and compare cash vs. finance or trade vs. no trade, big down vs.
perfect deal. "If you are an auto dealer, you should have this software"
the difference between order taking and deal making. We call it MULTIPLE DEAL DESK and it's included Free of charge! It is Auto Dealer Software. A Complete DMS and F&I System for New and Independent Used Car Dealers, Finance Companies, Leasing Companies, & Automobile Lenders & Lessors as well as Automobile Brokers and Boat & RV Dealers. Lease+Loan Master Calculates Payments on sales and Leases, Runs credit reports, completes documents & contracts, A&H Insurance,Gap,Service Contracts, manages 3 inventories, sells 4 Vehicles per deal, produces reports and payment coupon books, bills, pay off's, aging reports and manages multiple portfolios in the accounting module. Independent Used Car Dealer Software, that has your back. Boat Dealer Software, that can quickly type all your forms. Boat Finance Software, that understands multiple accessories. 3 inventories, sells 4 Vehicles per deal, produces reports and payment coupon books, bills, pay off's, aging reports and manages multiple portfolios in the accounting module. We now have an optional interface to send invoices, or journal entries and bills directly into QuickBooks 2003 to 2012. Just click File, Export to Quickbooks, select your options and it's done! You can get a demo of this feature for free! Quickbooks is a Registered Trademark of Intuit. Windows, XP, Vista and Windows 7,8,8.1 are Trademarks of Microsoft Corporation. Lease Master Auto Dealer Software is a trademark of leasemaster.com. 800 701-6686 or [Click Here] and we will call you! I own a small Independent Used Car Dealer, is this all I need? Yes as far as software is concerned you will be capable of negotiating sales and leases of automobiles, type the documents and provide the reports needed to file your taxes and manage your business. I have been searching for auto dealer software for some time now, I have downloaded a few and found them to be clumsy and difficult to learn, I got your free demo and loved the simple and fast interface, but I would like to know if the actual purchased program is the same. Our Free Demo is the actual purchased program, all We need to do to get off demo mode is a simple activation We can do over the telephone. I was searching for auto dealer software on the web and found that many sites don't show their screens, you can only get a demo by providing a credit card and have to request a refund if you don't like it. Yes, We have seen them too, they rely on aggressive sales efforts to persuade you to use their program, in our case We display all options and provide our free demo with no prior purchase, We can even create a custom form for you to test print before you purchase anything. I found other auto dealer software but the text on the screen is very small, the screens are busy and in ugly colors that are hard on my eyes, I mentioned your auto dealer software solution to them, with your simple re-sizeable screens, they said you don't include all the options they have, for example, life health and disability insurance, gap insurance, and weekly financing, do you? Yes We do, some text boxes are hidden from the main view to keep it simple when they are not in use, our file menu is a quick way to add and remove them and We have an advanced defaults that let's you choose what is visible and what is not. I recently got auto dealer software from another company, but every time there is a change they add a patch program it seems the program is getting slower each time they add something and the installation is more complicated, does that happen to all auto dealer software programs? It sound like you got a program that cannot be updated, many older applications where designed by programmers that are no longer available to make changes and other programmers write patches to attempt to make them work when new laws and procedures are required, the life span of those programs is questionable, as they become memory heavy and harder to use. In our case We are the developers of our auto dealer software solution and have complete access to 100% of the code So changes are never a problem. Is your Dealer Management Software Solution compatible with Windows 7 64bit? Yes We can print long forms and contracts directly using Windows 7 64 bit systems some auto dealer software vendors still require the Windows 7 32 bit, with our solution you can use any version of Windows, Windows 8 and 8.1 included. Is your auto car dealer inventory management solution software for auto sales dealerships available with BHPH financing and accounting? Yes if you select Window, Accounting you will be in the BHPH Module of the program. I am a used car dealer, I have had many DMS and F&I auto dealer software programs, some ok and some bad, you seem to understand my industry more than they do, have you ever been an auto dealer? Yes our founders went from selling on the line, to desk managers, Lease Managers and General Managers of some of the largest New and Used Car Dealers in the Country, A decade was spent as well as an automobile Broker, this program was designed for use in their own operations, and the sales of the program to outside auto dealers was by demand since the closing window was kept as a trade secret. The decision to sell the auto broker company resulted in 100% dedication to the software development. How many trade-ins can I have on a single deal? 2 trades are standard, each with it's complete description and Allowance, Appraised Cash Value, and Pay-Off. Can I have a report modified, is there a cost involved? Yes any Car Dealer or Boat Dealer or Finance or Leasing Company can request a modification via fax or e-mail and We never charge for report customization. Are you Integrated with a Red Flag Service for the auto industry? Yes We are 100% direct connect with Black Book Red Flag Service, you never have to re-enter the clients information, the program encrypts the data and sends it directly so you get the report in an instant. We are completely equipped to handle CSI, follow up and quality, with extensive reports, and modules that include reminder tickler warnings to call for everything from lease or loan end, to collections, and notifications. How do you compare with other Independent Auto Dealer Software Vendors? We have a unique approach to support and maintenance, when you call you are never waiting to be connected directly with a programmer, capable of modifying the entire program to fit your needs. I am a Car Dealer that carries my own paper, will this software do what I need? Yes our Buy Here Pay Here is robust enough to work for Finance Companies and Banks, but it was designed for the Auto Dealer that finances directly, you can print a payment coupon right after printing the retail installment contract or Lease. I am an old Independent auto dealer, and have always done things by hand with a ten key calculator, Do I need this? Say you ten keyed the right numbers and are in the process of filling your forms by hand, the customer may ask about an extended service contract or floor mats, at the last minute, you are so tired from handwriting, you may be inclined to "throw them in" and that over time can be very costly. With our Auto Dealer Software you can make a couple of changes to the deal on the screen and whip out another contract in seconds. What about those online services that let me type a document for that specific lender? If you don't have your own Independent auto dealer software, you will be subject to that lenders parameters 100% of the time, they will also own your client information and have all transaction details online, this may be ok for the clients you sold with them, but what about the ones you have not closed yet, you could loose your client to competitors once the web knows they are in the market for a car. What about the online auto dealer software subscription? Can I use the Free Demo? Or is it a bunch of pictures? You can use our Free Demo, it's a full running version of the program, with only one restriction; the customer last name is locked as Consumer. Does the one Free Demo, load both Lease and Loan Masters? Yes the Free Demo includes Lease and Loan Masters as well as the full Buy Here Pay Her, Lease Here Pay Here Options. Can I put an actual deal on the Free Demo? Yes you can enter an actual Lease or Loan, and the payments will be accurate, The only restriction is the Last name will be Consumer. Can I Network the Software program? Yes the program is compatible with Drive Letter Mapping to any PC or Cloud Drive. Can I Make my own forms, you know, align them to my own printer? Yes the program includes a form maker. You can create entire contracts including special formulas and additional input screens. Is this also a Desk Manager? Can I use it to pencil deals? Yes, the programs first screen is a Deal calculator and desk manager, you can have hundreds all over your desktop, with multiple deals or multiple quotes for the same customer. Is this similar to Tracker, Frazier, ADP or other Software for Auto Dealers? Yes and no, We all service the same industry but each has a unique way of doing it, most of our competitors are great products, and service your industry well, our unique features are the way We offer support and updates, when you call or e-mail you are never screened or made to wait while going through a long time wasting menu, you reach a live human voice capable of providing the highest level of support and information 99.99% percent of the time, and for that 0.01% your call is returned within a few seconds. We also believe our program is the easiest to learn and easy on the eyes. Most of our customers learned the program without ever reading a manual, our quick live tutorial gets you functional in less than 20 minutes. Do you do Independent Used Car Leasing? Yes We Do, Sales and Leasing Software for New and Independent Used Car, Boat and RV Dealers. Yes you can print remotely to satellite offices or network printers. If you are on a tent sale you can print all your forms locally or on the office printer. How easy (or difficult) is this software program to learn? Even though manuals and videos are available on this web site, the program is so intuitive you will have no problem getting used to it. We also offer free tech support which includes remote control training, where We will guide you step by step through each deal until you feel comfortable on your own. Can your system be networked? Yes, the full version of the program is network ready, you can choose to share customers and or inventory across the local network or across the country on the cloud. Can I get reports of activity when I am out of the office? Yes the program can send you e-mails for example when a cash receipt is made. Yes, our Month to Date Reporting module lets you select up to 9 items of each deal, and one filter to produce and memorize all kinds of reports. Can my records be stolen? or lost, or mixed with the records of another car dealer? We do not have access to your records. Your customer and transaction data stays on the local computer or on your assigned hard drive. unlike the other web based Independent auto dealer programs out there, Lease + Loan Master is a local program. Can an independent Used Car Dealer share a customer Deal with another? Yes you can save a single deal to your desktop and e-mail it to another auto dealer. Can I do Rule of 78 and Simple interest deals? Yes you can even change a deal from Rule of 78 to simple or from Simple to Rule of 78. Does this program help me manage auto dealer prospects? Yes, We include a simple contact manager, capable of storing your prospects, with calendar links to remind you when to call again. The program will also create a complete phonebook of existing clients, pulling the prior deal up when you enter parts of a phone number, name or Vehicle. Form letters can be merged with stored customer information. What about 365 day year vs 360 and the different calculation methods? Lease and Loan Master is compatible with all existing methods, for Lease and Loans, as innovative calculations are added, We continue to include them. In Leasing We include Payment Factors, EAB, Tilden and the regular Money Factor, APR and rent Factor. In the Loan Master We have both Rule of 78, Simple, and all the various ways of calculating the number of days in a year and the number of days to the first Payment. We also include Zero APR rollbacks and Lender Fees that change the APR, Life Health and Disability Insurance and Etch, Gap and other additions. What if I need a special formula? We add special formulas on all our forms, and will also modify the program on request. Can I process multiple Deals or Quotes? Yes, multiple quotes is our specialty! You can run many instances of the program on the same screen a few could be different scenarios of the same deal. Others could be different deals all together, you can save all to your working folder to review and continue the sale later. Yes, of course, all our tech support is in the USA We also have spanish speaking technicians, try calling our support line 800 70106686 you will speak to our top level support every time! Can an Independent Auto Dealer use this as the only F&I program? Yes, this is a stand alone program, even though it can connect to quickbooks and other programs, it doesn't require them. I was recommended your program due to it's closing tools, can you explain? Yes, Our program can roll back payments to the Sale Price, Down Payment, Interest Rate, Balloon Payment, Service Contract, The Term or Trade in Allowance. By rollback We mean you can change the payment and the calculation changes the desired item so that the payment you request is achieved. This is very important during the negotiating process, and is simply not available on web based applications. Additionally, you can separate many quotes on the same screen as you go through the process of closing, So if you need to give up on the price of the service contract you can make some of it back on the rate or the trade. By keeping the quotes on screen you can always go back and forth. Each screen can be resized and placed all over the screen, numbers are easy to read and placed intuitively, Best of all, the second your customer agrees to a deal you are happy with, you can print forms and present them for signature without delay. What do they mean when they say I will smile when a customer asks a question? Most other programs are cumbersome requiring lengthy procedures to complete or make changes to a deal, you move from one module or page to another, and many items will not work unless the page is filled in completely. Once you and your customer agree on the price, there is little incentive to make changes when questions are asked. Our program was designed to make that process so simple you smile when the customer seems to stop the process to ask about adding or removing an option in equipment or financial terms. For example, if the customer wonders if they should keep the trade in out of the deal or remove the warranty, or add the satellite radio option. You can smile because you can make those changes on the fly, keeping each quote open on the same screen, completely in control of your increasing gross as you go from plan A to plan B or C etc. Can you show me an example of the above feature in a deal? Lets say you have pretty much closed a deal with a Trade-in worth 2000, that you had to allow 2300 in the negotiation, so you are over allowing 300. And as you present the papers for signature, your customer mentions their neighbor wanted to buy the car from them for 2400. If you are using a complicated cumbersome or web based system, you push to have your customer sign anyway, and if you are successful you complete the deal and begin to work on getting your next up. But with our program you can smile, and quickly remove the trade on a side quote, to show the customer how little the payments change if the trade in is removed, how their 2400 will go a long way if saved, and in the process you avoid the 300 over allowance that was going to impact your gross... Everybody wins! That is the difference between "order taking" and "Deal making". Many times customer will ask about Floor Mats, or extended Service Plans at this point and if the papers have been printed you may end up throwing the item for free instead of continuing to close and increase your profit. What about the Multiple Deal Feature? Say an independent used car dealer, advertised five Vehicles in the local paper including special lease or finance options and payments, each of those 5 cars can be saved as an icon on the desktop, making it easy to process the sales by just adding the customer name. While a customer is completing the application, you can pop up another Lease or Loan Master and enter a totally new transaction, and bring up more to answer a question from a sales call. The number of deals on the screen is only limited to your computers memory, and monitor size, most can easily have over 50 separate deals open at the same time. Web based application vs Stand Alone, which is better? Security, Web based applications use encryption, but every keystroke is sent across the web and can be intercepted, the hackers are working day and night to un encrypt the information and large servers are their main target. Stand alone program are separated from the web, your PC can be totally disconnected from the web and the program will continue to run. In simpler terms a web based program is like keeping your car in the alley with a good alarm system, and a pc based program is like keeping it in your own garage. Speed, Our program has the ability to iterate through millions of calculations to roll back to a desired payment, and you can run hundreds of instances of the program to hold work in progress, as well as printing up to 18 forms at a time, Reports run by reading thousands of individual files as they are produced, and you can recall a deal from a decade ago just as fast as a deal from yesterday, all that would be impossible for a web based program. In simpler terms a web based program is like driving the martian rovers by remote control while a pc based program is in your hands 100% of the time. Accuracy, Many web based program suffer a varying lag when typing into text boxes, caused by the changing connection speed and the possible tie down of the server in busy periods, this can cause inaccuracy as names are misspelled and numbers missed. With a stand alone application this is completely avoided and you can look at the keyboard knowing that the keystrokes are being accepted by the program. Economy, Most web based programs are more expensive than stand alone, they require a subscription with monthly payments forever, your data and files are held hostage unless payments are made, and they can raise fees at will. Stand alone program can only charge for support and updates, most of those charges are optional and your data stays on your pc. Customizing, Web based applications are very difficult to customize, they would require a change that affects all users, on the programming side they are very difficult to program so they are compatible with the many browsers and platforms, this makes it impossible to use a what you see is what you get programming procedure, mistakes take longer to correct and you are slowed down by updates and server repairs you have no control over. State Specific, Web based programs cannot be State specific so you end up with a bunch of space wasting boxes you never use, making the screen busy and difficult to read. Conclusion, with the power of the PC, increasing every year, We believe web based is a step backwards, where you give up speed and functionality that is priceless in your industry, the advantage of transportability can be overcome by installing in a laptop or tablet pc, the program is also friendly to remote control such as goto my pc and goto assist or meeting, so you don't have to give up anything. What other differences are there between your auto dealer software program and Tracker, Frazier, ADP, UCS, Desk Manager or other Software for Auto Dealers? Additionally We have unique features such as Multiple Screens, where you can work on many separate auto dealer transactions, or the various plans or scenarios for the same deal, Most other programs either have a single instance limitation or offer a separate deal calculator, which requires re entry of data once a deal is agreed on, With our solution, you could have various transactions on the screen and proceed to type forms on the active one, before you switch to the next, all this without hitting the save button. We also have the ability to program a new form a few minutes after you fax it, with our calibration options We no longer need to wait for you to mail originals. We also have and continue to add special finance modules and sales closing tools, The entire program is dedicated to enhance the quality of your sales or lease deal. What about sharing a deal between two offices, do I have to send the entire database? Sharing can be is as simple as attaching a small file to an e-mail, or saving it to the cloud or flash drive, each deal is a single file, so you never have to send the entire database. Small software Company vs large Corporation, which is a better program? The choice is yours of course, We believe We are good for you because We can quickly make changes to customize this software to fit your needs, We are always available for comments and requests, using the same telephone number for support and sales. Large companies need to set rules and procedures to operate, many times this could cause delays in their ability to respond to your needs, and to get the upper management to hear your feedback. Lately many companies lost the ability to make changes to programs that where written in the 80's by people who are no longer affiliated to the company. I am a small used car dealer, I have had your program since 1988 but never updated or contacted you since, If I update to the latest version will I loose my customer list or records, will I have to convert them? And what is the cost of updating? Is this Auto Dealer Software all I need to type contracts, store and report on deals and manage my dealership? Can I charge a credit card directly out of this auto dealer solution? Yes, this auto dealer solution includes the ability to select the down payment, pickup payment, or monthly payments and charge them to your customers credit card directly. Can I export my inventory to my web site, auction, CAPS interface, Authenticom, Credit Acceptance Corporation and the like? Yes, all it takes is saving your username and password, the auto dealer can send a specific report, no charge for customization, you can select what to send and what to keep, filter and modify at will, the best part is the report can be placed on the remote ftp site with the click of just one button. Is the Free Demo really free? Yes, Our Free Demo is really Free!, no deposits are required, if you are asked for a password, just call our real person 24/7 phone 800 701-6686 and We will give it to you. The free demo is the actual program with all it's features and options, the only restriction is the last name of the customer and a counter limiting the number of uses. How do you compare with other programs? We are faster, better, and easier to use, some other programs can over restrict your deals, or make it too complicated to complete a deal or type forms and contracts. We make it fast and easy, you can enter a car, truck, boat or rv deal any way you want, and in any order. Forms are easy to find (We have a graphical interface showing pictures of each form) and the printer doesn't have to be set up or changed, some forms can go straight to the dot matrix printer while others are set to go to the laser or ink jet printer. Our screens can be resized to show larger fonts that are easier on the eyes, and We continue to improved by taking your input daily and posting updates that provide immediate results. My current Dealer Management System DMS is too complicated, I have to fill in too much info, more than is needed for a quick sale, do you have a better alternative? Yes We do, our program can close a complete deal with only the price and term, without entering the customer, as you would do if you want to enter the customer later, you can enter information in any order and there is no forced procedures to complete. I have a problem with my current Auto Software Vendor technical support, they make me jump through hoops and can't seem to solve anything. We have a unique approach to technical support... Continuously updating the program to make the questions unnecessary, We answer the phone with a live person ready to give you the highest level of support on the spot. Our Sales line is the same number as our support line. My current online DMS (Dealer Management System) gets a little jumpy, sometimes what I type is ignored, and has no way of rolling back payments, How does yours compare? Online programs are difficult to write and maintain, the promise of mobility by using the Internet explorer, firefox or other browsers to operate limits the things the program can do, and forces the transmission of your deal data back and forth on the internet. The PC has advanced so much in speed and features it is sad to see how all of that is sacrificed for the sake of mobility, We can understand using web mail for example instead of Outlook, and We learn to deal with the excessive misspelling and typos is produces, but for a Dealer Management System to work it has to be close to perfect, fast and accurate, and you can only get that on a local installation. What about my satellite offices, can We share the data? Yes of course, you can assign a drive letter anywhere inside or outside the local office, you could also set up a server in the cloud and have the separate offices share customers and or inventory from all. I am Fed Up with my current DMS, I am constantly informed of the things I can no longer do, In the past I was able to roll back payments, and do multiple quotes, Now they say it's not possible due to server issues, why do I feel We are going backwards? We hear you, that is the problem with the trend towards Web based applications, the DMS that is Web based is constantly changing, they continue to remove features for the sake of saving bandwidth and you are the one being sacrificed, they modify your printers to fit their system, so you can no longer use them with other programs, and features like a payment rollback are removed and no longer available. Leasemaster is not web based, it is a free standing Auto Dealer Software application that includes Roll back payments and will not alter the way you use your printer with other programs, We don't even need the Dot matrix printer to be the default printer and Yes We can print 33 inch long documents. Multiple quotes are only limited by your pc's memory, the average pc can have up to 50 deals open at the same time. How fast can I get your Auto Dealer Loan Master? You can download our free demo in the next 5 minutes, order the program online and activate it in another 5, We can program a form for you after you print our calibration sheet on it and fax it so you could be typing forms in the next 25 minutes. What if I have a custom Purchase Order with my logo on it, can you program that? Yes We can, simply e-mail the Word, Jpeg, PDF or other electronic format of your PO, We can program it to print entirely on your color printer, or if you have preprinted copies, print our calibration pattern on it and fax it. We can align all the information in minutes. I own two auto dealerships, can I handle deals from both while keeping them separate? Yes, you could have 10 or 20 dealers and have a separate icon on your desktop for each store, You can save set parameters for each type of transaction and save them as icons on your desktop. Can I send a deal from one auto dealer to another auto dealer? Yes, you can actually e-mail a single deal or quote, you can also save to a flash drive or a networked server or drive in the cloud, if you decide to e-mail a deal the recipient could simply double click the attachment to open and view the entire deal or quote. Can you help if my PC starts acting up? We are of course experts in our program, but if it's something We have seen in the past We will be glad to offer support, and if We can remote control We will fix it ourselves. Can you install my Auto Dealer Software for me? Yes We can connect to your desktop if you want and We can do the entire installation for you, you can go back to selling cars while We do all the set up. If you want We can install the demo on your pc for you, just give us a call and We can schedule an installation and a free tutorial. Can I have my repair order checks update my inventory directly? Yes with our Quickbooks Interface option your repair orders can go directly to your auto inventory database. Can all my Car Deals go straight to Quickbooks, itemized and in detail? Yes with our transaction interface your entire deal will move over to Quickbooks, without having to manually import them. I am a Buy Here Pay Here Auto Dealer, Sometimes I am not in the office and a customer comes in to make a payment in cash, how can I control this to avoid the possibility an employee may keep the money? The LeaseMaster has a special e-mail setup that will send you an undetected e-mail whenever a receipt is printed, if you instruct you customers never to pay cash without a receipt you should be able to reduce crime. Can I make my own auto dealer forms? Yes, our solution includes a form maker, so if you prefer to create your own, you can. You can make a few and order others from us, your choice, We believe as an automobile, boat, rv dealer you should have control over costs and the ability to have 100% control of what gets printed in your documents and contracts. What about printing Auto Dealer Window Stickers? We can print them all, with your logo and colors, on labels or plain paper. What about form letters, thank you letters, follow up letters for mass mailings? Yes, Yes, Yes We do it all, you can make all sorts of lists, and phone lists of your sold and working auto dealer customers, We can embed your designed letter to fill in the blanks instantly. I have read fantastic reviews of your auto dealer software program, however I have never seen you in trade shows or any advertising? True, We pride ourselves of being dedicated to serve your industry, We have maintained a zero advertising budget for over a decade and continue to grow by word of mouth, the price difference between our product is a reflection of the savings of this method. I have been shown by other auto dealers how quickly they can get a form programmed, and how fast you answer the phones, how can you do it? Others get their lines overwhelmed with tech support calls and put people on hold for hours. We have a unique method of operation, We use the same telephone number for sales and support, if there is a problem and support calls are too many, then the sales volume will have to drop. So the effort is in maintaining an easy to use program that requires very little support, when ever We get a call with a question, We always rethink the program to make the necessary changes so the call is not needed in the future. We also continue to enhance our technical frequently asked questions section to include the new solutions. I currently am considering ADP's lightspeed program but the price is out of this world, I also hate being told how to run my business can you help? We will not badmouth a competitor, We are sure a large system like ADP's is beneficial to many in your industry, and We are sure some businesses could use stricter guidelines, many of their subscribers are New Car Dealers that where instructed by the Factory and Franchise regulations to use ADP. That said We offer an alternative that you can control at prices too low to compare, and Yes We do service New Car Franchised Dealers too. I thought I had the Best Auto Dealer Management System, it was expensive and will remain unnamed, They never answer the phone, I can't figure out how to use it, and when I finally get a call back they patronize me to death. We have heard of them... Some software vendors are in fact re-sellers of other products, they mark up the price and push more sales that can be handled by support staff, the patronizing is their way of limiting the volume of tech support calls. My current Auto Dealer Software Vendor said I have to buy another one, because the old one is no longer valid, will you do the same? We have a prime directive of retro-compatibility, our clients can work on a customer last saved in 1988 on our old DOS version just as fast as they can work on the latest Windows 7, of course in 1988 We had no fields for Cell phones or e-mails, but the latest program can still recall the oldest deal instantly. What keeps changing is the Operating system (like the version of Windows) We are constantly adjusting to fit the new versions but always keep the original format. And no you don't have to re-learn the system. My auto dealer software vendor said they can't make changes anymore, something about the code. Many of these programs where written by people that retired years ago, the technical support was outsourced to India and all they can do is add patches to the code, eventually the patches get patched and the program slows down to a crawl. We are the developers of Lease &Loan Master and use no vendors or "sales departments" so We can open the code and make changes on the spot. Is your auto dealer software compatible with Windows 7 32 and 64 bit? What about printing? Yes We are, and We have the long form drivers for the 32 and 64 bit versions of Windows 7 You can print forms up to 33 inches long! Do I have to make the Dot matrix printer the Default printer? No each form has the ability to remember what printer you want to use with it, for example, if you want to print a letter or a plain paper form you can set it to remember to use the laser or color jet, and for a long Bankers Systems Contract you can set it to remember the Dot Matrix. My State has specific requirements for taxes on sales and leasing of cars and trucks, can you comply? Yes We are 50 State Ready, and have also implemented Canadian and European Leasing and sales, Since We service what We sell We can continue to adapt and make changes to fit the way lawmakers continue to change taxation and regulations. Is this software only for auto dealers, what about boats, rv's and motorcycle dealers? We are currently servicing 60% of our customers are auto dealers, the other 40% are boat and powersport dealers, many RV and Motorcycle dealers are combined with the auto dealers, all use Lease & Loan Master for Windows. Lease Master was created in 1988, originally it was a Auto Lease program, the Loan part came a few months later and found a niche because it was working on stand alone IBM pc's instead of requiring the use of server and terminals that where very expensive to obtain, We embraced the Windows Operating system as soon as it came out, and evolved over the years with it. Most of the ideas that made this program great came from one on one contact with our clients and our undying effort to satisfy requests. So that is 23 Years of development and experience! I am a used car dealer, We have special needs for calculations and presentations, you can call it sales aids, what do you offer in that? We also have fuel savings comparison wizards, to help decide if a hybrid Vehicle saves money when comparing the price to the fuel consumption savings, Special financing to look up your inventory and find qualifying cars, cash conversion calculators to show if financing is a better choice than paying cash, menu selling, weekly conversions, and many many more, as you come up with plans and formulas We add them to the program at no charge. How much does it cost to get VIN decoding? You know, where you type in the Serial number of the car and the program gets the Year, Make and Model? The VIN Decoder is FREE, it also works to verify that the Serial number you typed is correct. What is the cost to make auto dealer custom Forms? All State Forms are Free, When it comes to custom forms If you order 10 they are $45.00 each, or $50.00 if you order 5 Any form We make is covered for a year of changes, adjustments and modifications at no charge. I am a car dealer, but I need special custom reports created, what would the cost be for them? All custom reports are FREE, there is no additional charge. I am a Buy Here Pay Here Automotive Dealer, I require Metro II reports, what is the initial charge and monthly fees for this? Metro II reports are FREE Included with our optional Buy Here Pay Here Module. What about Payment Coupon Books? FREE - Payment Books are included FREE at no additional charge. 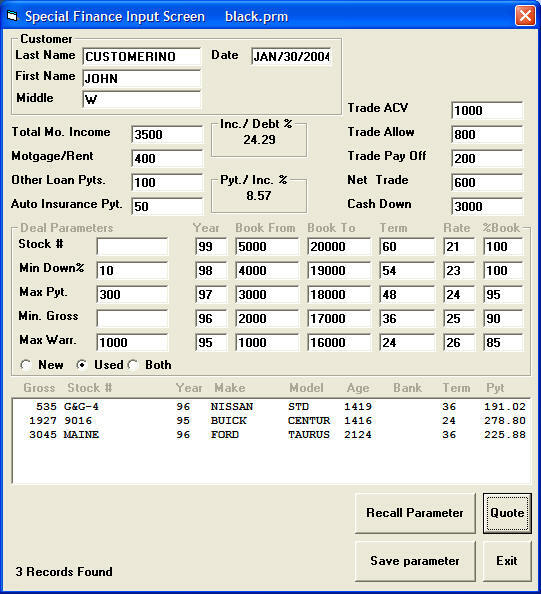 What is the cost of the interface to run credit reports for a car, boat and RV dealer? FREE -The Credit report interface is 100% FREE of charge. What is the cost for technical support? Quickbooks support, and or Network Support? I am an Auto Dealer, I need to have special Window stickers made, What is the cost for this? What about plain paper forms, You know where you print everything on plain paper without inserting a pre printed form? Same as any form, but We can't reproduce Copyrighted material, you would provide the graphic logo and text. If We receive written authorization We can reproduce the forms on plain paper for you, Bankers Systems Sells license for those on a per financed contract basis, so you wouldn't have to pay for unused forms, only the ones you complete. What do you charge for remote access? FREE - Remote access is included at no extra charge with our full support option. I am a used car dealer and need special finance software, what is the cost of that option? FREE -Our special finance module is included FREE. What is the cost for weekly payment conversions? You know where a monthly installment loan is converted to weekly or semi monthly payments? FREE -Weekly, bi Weekly or Semi Monthly Payments are all FREE the program has the ability to convert to Weekly, Bi- Weekly, Semi Monthly, Monthly, Quarterly, Semi Annual and Annual Payments on both Sales and Leases. What is the cost to export my inventory to my website or other web services? FREE -There is no charge for inventory export modules or reports. What about Credit card Charges, can the program process a charge transaction? Any fees? FREE -Charge it Pro is included with the program at no additional cost. What if I need you to interface with another program, what is the cost? FREE -All integration is offered at no charge on our part. I run a medium size Used Car Dealer, and I currently use a Online Dealer Management System, apart from being very expensive, I am getting frustrated with the Down Times, it seems every time they add a new user the entire system slows down to a crawl, I get messages that are similar to my Yahoo mail... We are sorry, the page can't load due to a temporary error. You can try back again shortly, or visit our help pages to troubleshoot the issue... This seems to happen more often each time, and forget trying to call them, when this happens it happens to everyone, and their lines get clogged up! I can never get them to make changes and they seem to make their own so I find myself having to learn a new program every time, Sorry for the length of my question, but I am venting... Can you help? How are you different? Are you Online or Stand Alone? Yes We can help, our program is Stand Alone, so you would never have to be down, and if you manage to crash your own computer, our support will not be clogged, your call will be answered by a real person and you could be back in business in no time. Will this program roll payments to the Term, I run a small car dealer and We keep the payments the same, just changing the term of the loan, kind of like the 99 cent store, but our payments are all 199. Yes you can roll the payments to the term. I love what I have seen so far, But I need to start small and grow, can I buy this auto dealer software in payments or in parts? Yes, call us and We will work with you We offer no contract rental and no contract payment plans. We are a large multi franchise New and Used Car Dealer, The Factories want specific reports and files transmitted, can you work with us? Yes, All We need is samples of the forms or data you need and We can make them for you, additionally We can keep each Franchise separate, and provide reports on each and the entire group together. I run a multi office Car Dealer, each office sells cars and trucks, but I need to see all transactions as they happen, and they need to share the inventory, Can you explain if you can do this? Inventory can also be shared on the cloud, on a separate location, There are ways for you to see all deals but each one would only see their own, while sharing the pool of inventories. You can also instantly see the last calculated deal at any time on each of the locations. Will you be able to handle the 999 plan, 20% , 15% or any other form of VAT tax people are talking about in the future? Yes of course, We are already capable of handling the Canadian system, but our programming dept is always on top of the latest changes. I am a New & Used Car Dealer, I am not very computer literate, so learning a new program may be tough, can you help? Yes We can install it for you, and teach you and your employees one on one via remote control (where We see the same screen) both having access to the mouse and keyboard, We can have you functional in 30 or 40 minutes, all at no extra charge. Why is your company name Leasemaster.com when your product is the best auto dealer sales software out there? It goes back many many years ago, We haven't changed the name because it is a well known brand, Leasing is still how most dealers find us because their current F&I System doesn't provide it, and We eventually get you the Loan Master module too. Can I order your Auto Dealer Software while using another Auto Dealer Software at the same time, is there a conflict when two are installed? Yes you can have as many Auto Dealer Software DMS Systems and F&I Systems as you want, there is no conflict, many enjoy the benefits of one while other people in the office are used to the other, We can even assist in exporting or importing data so the systems share information. And if your printer has been modified to fit them We can adjust our forms so you can print them without altering their settings. I already have your Auto Dealer Software Solution installed, and my partner wants one, is the cost the same, or is there a discount? Yes there is a discount, the first license is 550 and each additional is only 350 for the Loan Master which does Sales Contracts and Financing. We can also network the two licenses so they share inventory and or customers, they can share and also work while disconnected without any problems. Believe it or not I still fill in all my contracts by hand, Do you think I would benefit from using a computer to fill in my forms and contracts? Yes you would, We can make the learning process easy, by taking you step by step, We do the installation, We set it all up, and then We play sample deals with you as you learn the basic steps of deal calculation and form completion. Warning We have been told this program is addictive. I run a Buy Here Pay Here operation (BHPH) and sometimes I have a life, and find myself out of the office, can the program notify me when cash is received? Yes the program has the ability to send you secret e-mails when a cash receipt is printed. Can you see my customers and their accounts and payments? No all your data is saved locally in your computer's hard disk drive, and none of it is stored on the web, unless you specifically choose to use the cloud and put data there. I am torn between getting your Auto Dealer Software and another program my bank will give me for free, Why should I choose yours? Nothing is really free, your Bank has made arrangements with a web based auto dealer software provider to give you a base account, they limit it to deals done with that bank only, and the parameters are all based on the specific Lender. That may seem good if it's the only Bank you have, but you should still be able to type cash deals and Credit Union Deals, and be open to doing business with the Factory Lenders and other Banks (competition makes them honest) If you have your own DMS you control what you sell and how you finance it, you records belong to you and no one else. I bought a Used Car Dealer that has and old program called Tracker, I can't find the company or any support for it but it seems to work, Should I change to your auto dealer solution or can I stay with Tracker. The choice is yours, some of those older programs lost access to the code and can no longer make changes, as you know Lawmakers are always finding ways to make you change the forms you print and the way taxes are calculated. We have heard of programmers that offer to patch up old programs but the cost is too high. The best advise is to Install Lease & Loan Master and process your new deals there, while you keep the old program to work on old records, you can also have us convert the old records for you if you want. At Leasemaster.com We created this program ourselves and have complete 100% access to the code and the ability to keep up with the changes. I am a Used Car Dealer and New Car Auto Broker, I currently use a program DMS I shall not mention, The question I have has to to with support, when I call them, I get put on hold for long times unless I select I want to buy something, its upsetting, are you any better? "if tech supports slows down sales... so be it." How many deals can I have opened at the same time? My New car lot gets busy on weekends and I need a program that can walk and chew gum at the same time. The number of opened deals is only limited to your computers memory and monitor size, The average Windows XP Vista or Windows 7 PC on the market can easily hold 50 deals at the same time, but with one of those giant flat screens and a fast PC you could hold three or four times more, each deal kept completely separate from the others, and capable of duplicating itself for advanced negotiations. I am a Used Car Dealer, and what I have a problem with is the promises I am made by the sales department of a large auto dealer software company versus the reality given to us by technical support, how are you different? We hear that a lot of our competitors, We felt the separation of sales from support is the cause of most of it, to avoid this We service both sales and support from the same department, any demo presentation and statements of what the program can and cannot do are made by top level support representatives. If one of us promises a feature that doesn't exist he or she would have to create it. I hate my current Auto Dealer Software vendor but they have a feature I haven't seen in your demo, can you add new features? Yes of course, We do not reverse engineer but if you request a feature or calculation We can surely program it for you. Can you print a Lease Agreement out of a purchase calculation, I need this to do a Lease first for 1 year and convert it to a purchase. Yes We already have the setup, creative financing and leasing is surely becoming one of our most unique features. I own three used car lots, and need software that will keep my inventory separate, can your program do that? Yes, We already have an inventory module that can keep 4 separate databases, and you can move Vehicles from one to the other, and produce reports individually or all together. I need special inventory reports made, how much does it cost to program? Any reports We create for you are free of charge. I have multiple investors for my Buy Here Pay Here Auto Dealership, can We keep their money separate in the same program? Yes We have the ability to maintain unlimited portfolios, and you can sell paper from one to the other too. I have a Finance company, my current software program can't produce a metro2 report (to tell the credit bureaus how people are making payments) once the account has been charged off. I need something that can continue to report charge offs, does your program do that? Yes We have a specifically named charge off folder, when you move the account there, the metro 2 report will continue to read it and report on it. I waste a lot of time waiting for my customers to make their minds up, and sometimes a line outside my office is formed with the next customer ready for F&I, is there a way to enter the next clients information while my current one ponders the deal I offered? Yes that is exactly what We do with our multiple deal interface, you could have 50 or more quotes on the same screen and switch between clients with a simple click of the mouse, you can use it to keep separate options open for the same client (plan A plan B etc.) or you could get the next deal ready while waiting for a decision from your current client. I have a small auto dealer, I am currently paying 200 per month for a web based dealer software program that has a poor deal calculation interface, but they provide my web hosting and post my inventory in the auction site, what can you do? Wow 200 per month is 2400 per year, you can get a web site with Hostway for 15 per month, your LeaseMaster for 299 or 550 total and We will post your inventory wherever you need. at a savings of 1921.00 per year! I also have that 200 month plan, and the worst part is they never answer the phone, they are located in India! Well our support line is the same number as our sales line, and it's located right here in the USA. I wanted you to know I made the switch a few years ago, I had one of those online auto dealer software services, and paid a lot of money every month, but then I realized it's ridiculous to go backwards to slow and jumpy internet based software when computers are faster and better every day, the installation hurdles of the past are all gone and the programs that run on my pc make me smile, No questions this time just Thanks. Thank You!, Yes We have noticed an increasing volume of clients complain about web based auto dealer software, and reacting with pleasure when they see how fast our program is , and the speed they can do a deal in. You want a program where if you hit a letter on your keyboard it appears instantly in the right box, and numbers are not jumping all over the place. I love the way I can resize the home screen (deal calculation) to any size I want, it makes it easy to quote and keep my negotiation edge, are you going to offer re sizeable windows in the other screens (Customer, Vehicle, etc.)? We already do!, simply place the mouse on the edge of any window and it will turn into 2 arrows, drag and drop when you reach your desired size. I am a used car dealer, looking for F&I Software, I got your demo and it looks simple, can you do things like Life Health & Disability, Gap Insurance, taxable and non taxable accessories, etc. Yes of course, the simple screen is there to help you work on a deal without getting lost in the numbers, the Tools menu offers all the other features and once selected they all show up on the same screen, please feel free to call 800 701-6686 anytime and We can give you a quick tutorial live online. I am a new car dealer F&I Manager We have a bunch of forms that We print on photocopied paper, like promises to pay off or agreements to furnish insurance, since they are photocopies they never align properly in our dot matrix printers, i was wondering if you can print the entire form on a regular inkjet printer? If there is no Copyright on the document We can reproduce it entirely and you can let the program remember the printer you want to use for it so you no longer need to be making copies and inserting them into the printer. Do you have your own Sales and Lease Contracts that print on plain paper? Yes We do, and We can also modify them to your needs, We don't have a per use charge so you get unlimited use of the forms We own. What items can I roll back payments into? Say I want a specific payment and have the program lower the price, the rate or something else. You can roll payments to the Sale Price, The Down Payment, The Interest Rate, The Balloon Payment, The Service Contract, The Term, The Trade In Allowance or a combination of these. Does your Auto Dealer Software import and export to other software programs? Yes We do! We can retrieve your customers or Vehicles from a number of data types, We can also create custom import modules to attach to other databases old and new. I Own an Auto Truck & RV Dealership, We have three separate lots and like to keep our inventory separate, you know the salespeople on the Truck lot sometimes sell a Used car, but it's not their main thing, can you keep them separate but allow them to cross sell? Yes, Our Vehicle Inventory Module is capable of maintaining 4 separate Databases, you can move Vehicles from one to the other but you can also pull separate and combined reports too. As far as the sales go you can keep them all in a single network or maintain three separate stores until the deal reaches the business office. Is there a limit to how many deals I can store into the Auto Sales program and the Buy Here Pay Here Accounting part? The only limitation would be the size of your computers hard drive, you could keep hundreds of thousands of deals and Vehicles in the average desktop pc. Can I get this Auto Dealer Software Program in pieces? or Do I have to purchase the whole thing? There are so many Auto Dealer Software programs out there it's confusing, What are the five things you have that none of the other auto dealer software programs have? We provide Auto Dealers a real service, our program is and feels solid, the keyboard response is immediate, no flickering, no loosing your place while entering info, the screens are all 100% intuitive and simple on the eyes, the calculations are solid and exact. I need a computer solution auto dealer software but I have no time for training, how long would it take for me to be able to type contracts? We can install the program for you in 15 minutes, and have you up and typing contracts with a simple 20 minute tutorial, Yes many of our users skip the tutorial and are able to figure their way around our program by themselves. In this economy, I am trying to increase my sales by offering financing or leasing of the products I sell, is that possible with your program? Car dealers have been doing it for decades, Yes it has increased with the economic changes We have all faced, as banks pull back and credit requirements increase, dealers can raise their sales by offering what car dealers call Buy Here Pay Here (BHPH) All financed sales must comply with the federal truth in lending act and Leases must comply with regulation M. Each State has their own additional requirements. Our program will be able to type or fill in your retail installment sales contracts, rental or Lease agreements, print payment coupon books and manage the payments and collection efforts as the Lease or loan is paid down. Some are finding interested investors and We can offer separate managed portfolios to keep their money separate from yours. Isn't the above like becoming a bank? Don't you have to be a bank to lend? If all you do is lend money, you are correct and would have to be a bank or other authorized and regulated lending institution, on the other hand anyone can lend money to friends or relatives as long as the terms and disclosure of interest complies with federal regulations. Businesses that are involved in retail sales of cars and equipment can also offer financing and leasing terms, when the collateral is the item they have for sale, Service companies can also offer their efforts on an ongoing basis with or without a contract. A document that complies with State and Federal Laws can be used to collect on debt agreed to and the collateral can be repossessed if done lawfully. So, your program isn't only auto dealer software, you are also Lender / Lessor Software? Do you have the registration Forms for every State? Yes We do (and you can see them in our Windows Vista & Windows 7 Demo, just select the Forms Explorer, and State Forms) You will Notice We have forms for all 50 States in addition to Guam and Puerto Rico, as well as some Canadian Forms and Forms for Caribbean Island Nations. The samples are only a small percentage of the forms in our huge database. Do I have to change my printer settings for your forms to print correctly? No, We will adjust the forms to fit your printers, all you do is to print a calibration sheet fax it to us and We use that for perfect form alignment, and notice that We said printers (with an s) We can set some forms for your dot matrix and others to your inkjets, each form will remember what printer it uses, you never have to use the printer setup button. What happens to my data, my deals and customers if I decide to stop using your auto dealer software? I am an Auto Dealer, I currently sell and sometimes finance customers, Can I Lease used cars? Yes you can, Car Leases are just as simple as Car Loans, the closest match is a balloon payment loan, our Lease Master Module makes the transaction simple, payments can be calculated with money factors or with APR interest and both Leases and financed sales are saved in the same portfolio, all accounts can be included in the same reports. What is the advantage of Leasing vs Selling for the Dealer? The transaction is easier when payments are lower, and since leasing only charges principal on the depreciation (the difference between the price [cap cost] and the option to buy [residual]) the payments end up being lower. The Negotiation is also made easier since very few of your competitors offer leasing making it more difficult to shop from car dealer to car dealer, this auto dealer software has the ability to put both a Lease and sale side by side to compare. Do I need a special Lessor License to Lease Cars if I am an auto dealer? If you are licensed to sell cars you can Lease them too, the contract you type must be Regulation M compliant, some States also have their own additions to that form, and many laws impose disclosure requirements, Most Auto Dealers ensure compliance by using pre-printed Lease agreements that have been created to follow regulation M, Your local department of motor Vehicles can provide additional information. I am a used car dealer and We carry our own paper, I hear there is a sales tax advantage to leasing, How does it work? It varies from State to State, Some States let you collect use tax instead of sales tax, so the tax is collected monthly on the payment instead of the full price of the car, for example if you have a 30,000 car and sell it in a State with 9% sales tax, the moment the Vehicle is sold you would have to charge and pay $2700 in Sales Tax, if your customer puts 3000 down, you would only have 300 towards the car, after paying license fees you may have nothing left, so your exposure if the customer stops making payments is 100% and you will loose additional money in repo expenses. If instead of selling the car you Lease it, then if the payments are 500 per month you would only charge and pay 45 dollars in use tax each month and you would only pay if your customer is making the payments, this would lower your exposure and let you keep most of the down payment money. I have noticed you offer the Lease Master and the Loan Master, are they two separate programs? I am an Auto Dealer, I currently only sell cars but I may want to add Leasing in the future, will I have to work with 2 separate programs If I order them separately? Our Lease Master and Loan Master are parts of the same program, they share customer, Vehicle and misc information, and If you sell some and Lease others they can all be shown in the same portfolio, when you purchase only the Loan Master, the Lease Master is there, but it's not activated until you order it. Out Accounting module is both Buy Here Pay Here and Lease Here Pay Here. These Days a used car dealer is faced with a choice between putting it all on the web and keeping the information local, the proponents of web based software say theirs is the way to go, can you explain the two options? Yes, technology has greatly improved both types of DMS systems for automobile dealers, the software that you install in your PC is now easier to install and update, both are usually a simple click away, PC's are now more stable and faster as well as secure, programming changes is easy because the interface is exactly what you see is what you get, and speed is not affected by network capacity. The bottom line is that Stand Alone software will always be faster, more capable and secure than web based software. The web offers the appearance of simpler installation, because your browser handles the connection to your PC, but there are a lot of hidden cookies, and add-ons that are really program running on your pc's and with the variety of browsers out there you get into the same mess PC's had in the late 90's with compatibility issues. The other part of Web based software is that they update your program directly and all updates are mandatory, so like it or not you will have to learn the new screens as they pop up in front of you in the middle of a deal. Last but not least your customer files and inventory files belong to them. I had my sales representatives attend a seminar where the difference between order taking and selling was compared, can your auto dealer software help a true salesperson sell? Yes our software program was designed by some of the best sales professionals in the auto industry, the main feature of multiple deals on the same screen can help as you follow your 4 square sales process and enhance your negotiation ability, as you can duplicate the current deal many times over as you propose plans A B C and so forth, place your deals with and without a trade-in with and without service contracts, financing, leasing and the variety of choices are under your control. These days the sales effort has been devastated by the order taking that web based software stimulates, with lender shopping and credit acceptance becoming more automated your sales representatives become order takers and forget the art of the profession. We saw the beginning of this back in the late eighties with the special financing some dealers got involved in, customers where herded through a process and the boom led the way for the inevitable bust that followed. We give the name "Dealer" back to the automobile industry with the ability to negotiate using our software program. I am a used car dealer, sometimes We get a letter from the Department of Motor Vehicles or an insurance company requesting information on a Vehicle sale, do you include things like this in your search utility? Can I find a Vehicle or deal by the serial number? Yes you can search your database for VIN' portions of the VIN (like the last 6, or anything in the middle) license plates, phone numbers, Vehicle color street address of the buyer, social security number or any information entered during the process of making the sale, you can find any and all the information you entered in each deal, for example a Dealer received a cashiers check in the mail with no account number, or name, a search for the payment amount of 321.45 narrowed it down to two possibilities, and the postmark from the city of San Jose helped solve the mystery. Talking about searching and finding my current DMS takes forever to find a deal that is old, over newer ones, seems like the database can't handle a search it's not used to, is that also the case in your auto dealer software solution? No, our records are small delimited files instead of a huge central database so recalling a deal form thirty years ago is just as fast as recalling a recent transaction, there is no database to maintain. What about Loan Origination, and payments and collections, Does your software solution include this in the software package? 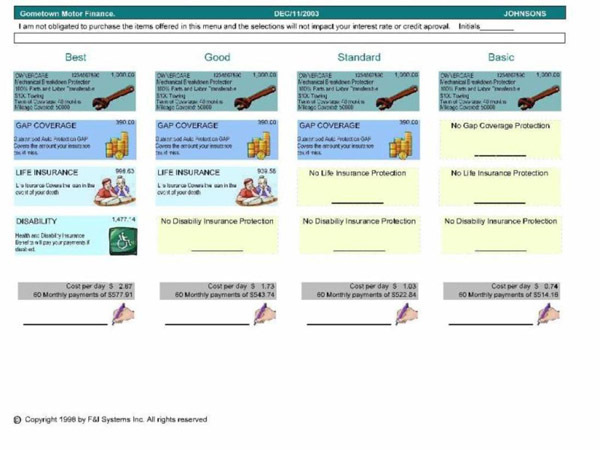 Yes We call it the Buy Here Pay Here (BHPH) Accounting option, the Lease or loan is entered in the main deal calculation screen, and then selecting the Window Menu and Accounting opens up the BHPH Accounting module where complete payment coupon books can be printed and payments posted, all the reports are included. Is your auto dealer software program compatible with all versions of Windows? Yes starting from Windows XP to Vista and Windows 7, We are currently working on Windows 8 testing, We stay in the forefront of the industry, unlike some competitors that are reselling programs that are no longer being developed, We continue to update and modify the entire program to fit the ever changing operating systems. I am currently using the Frazer auto dealer software program, they want me to buy an Okidata 320 printer, and mail them the forms I need that they don't have, I heard you are different in this, how so? We don't require a specific make or model printer the Okidata, is a very popular printer, but printers are expensive and if you already have an Epson, Canon, AMT or any other impact or dot matrix printer We can work with it and support your forms alignment because our service includes calibrating our forms to fit your printer, (not the other way around), all you do is print a simple calibration pattern on the form you want programmed and fax it to us, We can then send you the programmed form by e-mail or direct transfer, this saves a lot of time that is wasted by using the mail system. Continuing on the printer question, We have a very good printer that was modified by ADP to be used by their DMS auto dealer software, My New Car F&I needs this printer to remain in that state but it would make things better if We didn't have to buy another printer. (The printer We have is an AMT) Can this be done? Yes our system works perfectly in your case, you don't have to make any changes to the printer itself, and We will calibrate our forms to work with it the way it is, and with our fax a form system We can re- align all your forms the same day. My main lender just came up with a form that will no longer fit my printer (the form is 11 inches wide and the printer only fits up to 9 inches) if i buy another wide carriage printer, will I have to pay to change all my forms? No, all you do is fax us the forms an We re-align them at no charge. If you still want to keep the old printer We can make 2 copies of each form so you can continue using them, and since each form has the ability to remember the printer it was written for you will not run into problems. I switched to a Web Based auto dealer software program some time ago thinking that it would be easier to use and avoid the frustration of installing the program, but I have realized they are constantly asking me to switch browsers, add "add-ons" and cookies, making my web browsing less secure, and having to modify my entire system which now only prints to the Okidata printer and have to manually switch to the inkjet when I want to print something else, I noticed when I installed your free demo it was easy and simple, will I have to install more complicated things if I purchase the full version? The free demo is the entire program, if you have already installed it you are done, you will also notice the program works a lot faster with a local installation than a web based browser run remote application. Many software programs have benefited from becoming web based, in theory, it's a good thing when the program sits on a remote server and it can be updated and changed remotely, but the program has to travel the world wide web to get to you and every click on your mouse or tap of your keyboard has to travel all the way back, exposing itself to hackers and the annoying delays that continue to cause typos, with our program, when you are done for the day, you can turn your PC off and know your data is safe and secure. Will this program help with Inventory management? Yes Our complete Inventory Management Databases, help organize your Inventory, produce reports and enter repair orders. Can you modify the interface to fit my needs? Yes, We can usually make changes within a few days to fit a particular calculation or a completely different input screen, The current setup also allows for label changes and many calculation options. How do I get forms and contracts so my printer can print them? A simple procedure where the program prints a calibration pattern on the blank form, and you can fax or e-mail a scan of the document, We then use this to position the items exactly where your printer will print them. Can I use any printer? Yes as long as your printer can handle the paper you will use, We can fill in the boxes or print the entire form. What about those forms that print on plain paper? We can reproduce anything you give us and the form will print on your laser or bubble jet printer as well. Some of my GMAC Forms are Huge, 11 inches wide and 29 inches long, can you print them? Yes We have special drivers that work well even on Windows 7 32 bit to manage large paper. Some printers have difficulty but We can recommend the right one for your needs. Car Dealers have a heavy load when it comes to Software, we have to account for many fees and licenses the cost of many added items and the financing with all the regulations it requires. Can your auto dealer software program handle all that in the same application? Yes of course, our auto dealer software solution covers the entire rainbow of operations and reports you will need, in addition to what has been rated as the best closing tool available to the automobile industry. As Car Dealer we require the ability to make quick decisions and take the products of the negotiation process when they are offered, how do you handle multiple deals, what do I have to do (how many clicks) to save deal one and open deal 2? One, you can keep many deals open on the screen at the same time, and go back and forth between them as your customers ask questions and decide, you could even print an entire contract ready for signature, while still looking at the payments you are about to quote to another customer on the phone, this is the only auto dealer software program available with this feature, and the number of deals you can hold is only limited by your computer's memory, if you have one of those large monitors you could work 50 or 100 deals at the same time. I am an automobile broker, most of my transactions are done by the New Car Dealer, and all I get is a broker fee, how can I participate in the huge profits that are made in these expensive vehicles? As an automobile broker your only way into the real deal is to get a lender to let you get a split funding account, not easy in this economy but doable, some people purchase an old leasing company for participation in future business with little or no investment, and if the old leasing company has a line with a lender, that could be your ticket, then you purchase the vehicle in the name of the Bank and your customer, the bank pays the New Car Dealer the invoice on the car and split funds the difference to you, so if you write the lease at 40,000 and the Dealer is willing to sell it to you for 37,000 you would make the 3000 difference, the Dealer would never see the figures, all they know is they sold a leasing company a car for say 500 over invoice. If you asked the Dealer to run the deal for you they would only want to give you a broker fee. Another thing to do is to involve two dealers, you get the car from one and use the other for the financing, since the unit comes from outside their inventory they may be willing to share it with you. There are many In house Leasing companies that would love your business too. I have been told I am an "Order taker" instead of a "Deal maker" my computer program seems to be designed for order taking, it is web based and it seems to want me to go thorough a bunch of steps to complete a sale, but there is no ability to roll back payments or way to see my profit, under allow a trade-in or play with days to first payment, how can you help? It's very true with the latest in technology the automobile industry has drifted away from deal making towards order taking, some things have helped, for example you can shop for the lowest payment with lender comparison programs and shop for the lowest car by using the search engines, but sometimes the effort seems to drop the word Dealer form the auto dealer, and focus is applied to completing the order. Our program starts with a closing tool, a simple screen that can be duplicated and multiplied all over the pc desktop, to help you present scenarios as you work your standard 4 square negotiation, many users purchase our program for that screen alone. I read some reviews that say you have the best support rating, and least down time in the industry, My question is how can you do it while maintaining the lowest prices? We do have a unique way of providing support that shows on all reviews, our company is set up in teams, each team has a programmer, capable of modifying the code to fit your needs, every time we receive a telephone call we make changes to make the question unnecessary, what the reviewers notice is that our support lines are the same as our sales lines, and if one slows down the other, it prompts us to improve the program. The other auto dealer software programs out there have separate support from sales and development this forces the development to stop between versions until support can be notified of updates and sales sometimes doesn't know what they are selling. Our team is in direct contact with you 100% of the time and development is constantly merging your requests into the main program. The excellent reviews we get are proof this method is the best. I read a review that mentions Iteration Rollbacks, I am a Car Dealer, I understand Rollbacks, but what do you mean by Iteration? Iteration is the process where a payment is raised or lowered by making small changes to the calculations, in a back and forth way to achieve an exact payment, this process is preferred because the results are exact, most auto dealer software vendors are using reverse formulas instead, but that limits the calculation options, for example say you have a payment of 412 per month and you want to roll it back to 399, the formula method may work as long as you remove the Life Health and Disability, Gap Insurance, Rebates and Warranty first, but the work of having to remove and later add these almost defeats the purpose of the rollback. When we use iteration, the entire transaction including all additions is calculated as a whole, this is resource intensive but our program can do it in under a second and provide results that are exact. This would be impossible on a web based auto dealer software solution. I am a New car Dealer, I could install your program in my F&I offices, but do you have a separate program I can put in the closing offices, what would I put in the Managers Desk?, How would that work? The closing offices could have our deal calculation screen, in a network that could be read from the desk and F&I Offices without access to penciled transactions, the Desk could review all working deals in the closing offices (the box) with a simple click, the Desk could have multiple deals on the screen at the same time one or more for each closing office, so by the time the closer brings the deal, the manager has already reviewed it. The manager could pencil the deal and send it back to the closing office to present a counter offer. In the meantime the F&I Office could be checking credit reports and making after market presentations ready for when the customer is sent in for contracts. This greatly enhances the negotiating ability as managers are able to see the work that is being done in the closing office and the F&I Manager can prepare for the deal. I own a New Car Dealer, we sell as many as 500 cars per month, and of course weekends are when the most volume of sales occur, currently I have a Desk with 4 Desk managers each with a terminal of our DMS, I have seen your pictures on the Multiple Deals, How would that work for us and more important what would be the benefits? As you can see you could have a large LCD Monitor on the Desk and all four desk managers could participate on the closing efforts for all deals, as the salesperson presents the counter offers, you can see the calculation live and since all desk managers see all deals, there will no longer be a long line behind one of them while the others are "busy" and the entire process is more smooth and efficient, You will also find that each desk manager can work more deals at the same time, and the best feature is that the screen holds each prior quote so returning to a prior quote does not lead to embarrassing situations as is sometimes the case when multiple items are modified. I own a New Car Dealer, my question is how do you handle multiple managers in a single deal, doesn't the system crash when to people access the same file? Our file system permits multiple managers, each quote or calculation is added on top of the prior, when you recall a particular deal or customer it shows all the quotes, and they can be opened at the same time, each in its own screen. I have a Boat Dealer, Is this for me? Yes, the program is Boat / RV ready with the ability to rig up Boat, Trailer and two motors in one sale, 17 accessories or accessory packages and 14 repair orders, with itemized reports. Can this Auto Dealer Software be used to sell other things? Yes of course, the loan calculator can even figure out home mortgages. Is this software only for auto dealers? What about Boat and RV dealers, Motorcycles, Power sports, Equipment? This software was designed for auto, Boat and RV Dealers, Motorcycles, snowmobiles, jet skis, Hot Tubs, Exercise Equipment, etc. the inventory information section, lets you rig up Boat Trailer and up to two motors in a single sale, unlimited equipment packages and many fields can be customized to fit your specific needs. What if I need a special formula or specific calculation added? Yes, of course, all our tech support is in the USA We also have spanish speaking technicians, try calling our support line 800 70106686 you will speak to our top level support every time. What is the difference between the auto dealer and the boat or rv dealer part of the program? While most calculations are similar, there are many situations where trailers for example are taxed different than boats or motors, so We have four separate inventory tables, one holds boats, the other trailers and the last two hold the motors, so you can build a rig for the sale or Lease. The same way an RV dealer could separate a cab and chassis from the living quarters, fifth wheel trailer or other sections of the RV. We are currently servicing 60% of our customers are auto dealers, the other 40% are boat and power sport dealers, many RV and Motorcycle dealers are combined with the auto dealers, all use Lease & Loan Master for Windows. What is the cost to export my inventory to my web site or other web services? I am a Boat & Power sports Dealer, We do most of our sales under canopy on Boat Shows, will this work if We are not connected to the internet? Yes, the program runs local on your PC, you can install it on a laptop or tablet pc, after the sale you can easily save the deals back to your office network. I have multiple investors for my Buy Here Pay Here Store, can We keep their money separate in the same program? All this Auto Dealer This and Auto Dealer That is nice but it doesn't apply to me, Have you guys thought about software to finance equipment? Yes of course, We have a setting in our advanced defaults where you can select Auto Dealer, RV Dealer, Boat Dealer, or Equipment Dealer, The Equipment mode replaces labels that are obvious for car dealers like miles, fuel, VIN etc with Power Option and Serial Number, the Vehicle information module is renamed Equipment. We have Customers that sell, Lease and finance in our buy here pay here module form Hot Tubs, to Repair Work on Farming Equipment, Home Repairs, Solar Panels, Furniture, Computers, Sheds, Lawnmowers and Snow Blowers.